The girls in orange made a favorable first impression to say the least Tuesday in their 2017 home opener at the Mack Chase Athletic Complex. 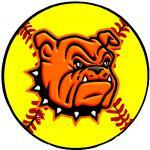 Behind a stellar performance in the circle by Kali Crandall and power hitting in the middle of the lineup, the Lady Bulldog softball team avenged an early-season loss to Carlsbad before an enthusiastic hometown crowd, upending the Class 6A Cavegirls 6-1. Artesia fell to their Eddy County rivals 9-4 March 11 at the Southern New Mexico Invitational in Las Cruces but never let the girls in blue get a leg up Tuesday, keeping Carlsbad off balance at the plate and getting the sticks going when it counted. The Cavegirls kicked off the contest quickly with a runner in scoring position but were shut down by a pair of Crandall Ks to end the threat. The Lady ‘Dogs proceeded to make their first home at-bat of the year matter. Alexa Riggs and Chanler Groves small-ball singled to lead off the home half and, following a fielder’s choice and a strikeout, senior Aubree Olguin sent a blast over the center-field fence to make it 3-0. Carlsbad threatened again in the top of three, loading the bases with one away on a Marissa Reyes single, a hit batsman, and an error, but Crandall again stepped up to strike out consecutive batters. 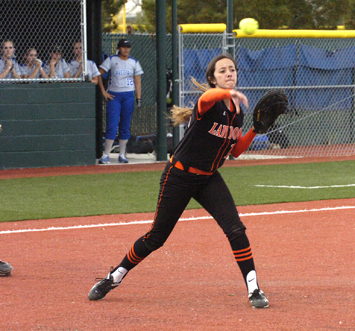 The junior hurler then aided her cause in the bottom of the inning with a solo home run to left, and a bases-loaded walk by Gabrielle Gomez and Olguin sacrifice fly in the fifth put Artesia firmly in control, 6-0. Another Cavegirl runner in scoring position was erased in the top of six on a fielder’s choice that saw catcher Melody Payne give chase down the third-base line before applying the diving tag, but Carlsbad would come back to prevent the shutout in the seventh. There, pinch hitter Teddi Garcia, aboard with a one-out single up the middle, was plated by a Brianna Aragon double with two away, but that would be it for the Cavegirls, as a ground ball to second ended the bout. Crandall went the distance on the evening, allowing six hits and one walk while striking out seven. Her Carlsbad counterpart, Bri Santo, gave up eight hits and six earned runs through six, striking out three and walking two. Both Olguin and Crandall went 1-2 at the plate with home runs, the former racking up four RBI and the latter one. Payne and Riggs were 2-3, Payne with a double. The victory bumps Artesia’s season mark to 5-2. 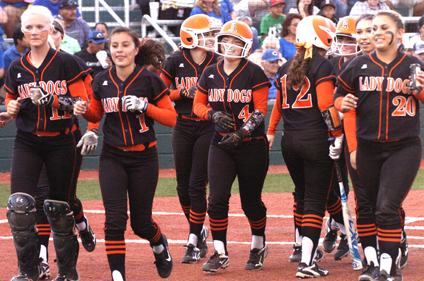 The Lady Bulldogs will close out the week at home with a 1 and 3 p.m. double header against Hobbs Saturday before preparing to host the March 31 – April 1 Lady ‘Dog Invitational. They’ll then head to Carlsbad April 4 for their final rematch with the Cavegirls.